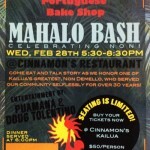 Agnes’ Portuguese Bake Shop Mahalo Bash! 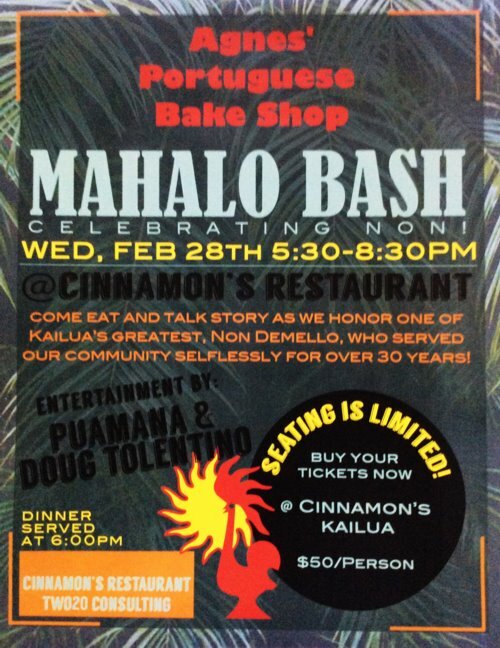 Come eat and talk story as we honor one of Kailua’s greatest, Non deMello, who served our community selflessly or over 30 years! Live Entertainment by Puamana & Doug Tolentino. Dinner is served at 6:00 PM. Tickets available at Cinnamon’s Kailua. Join us for Valentine’s Dinner, Wednesday, Feb. 14, 2018. Please note our holiday hours for the remainder of this year! And for those of you visiting the 9th Island (Las Vegas) we will be closed on Christmas Day and New Year’s Day. Otherwise hours are normal. Aloha! Cinnamon’s at the ‘Ilikai will be CLOSED on Tuesday, August 8th and will re-open with our usual hours on Wednesday, August 9th at 7:00am. Part is for fire-sprinkler repairs; and part is because we are taking our unbelievably HARD-WORKING & AWESOME staff to the beach for a well-earned BBQ & fun day!! !